Going to a sushi omakase dinner isn't my how I normally relax after a final but I wasn't about to turn down a chance to catch up with some of the other food bloggers in the area. A hearty thanks to the FoodDigger crew (Brian, Marshal, and Will) for hosting the event. 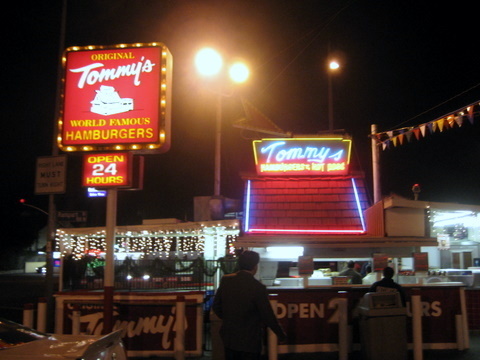 The restaurant is a small nondescript building with an old illuminated sign out front. Inside the restaurant is wood paneled with a sushi bar running the length of the restaurant and a couple of tables in the back. Scattered around the restaurant are knickknacks that have accumulated over the years and they give a sense of history to the place. 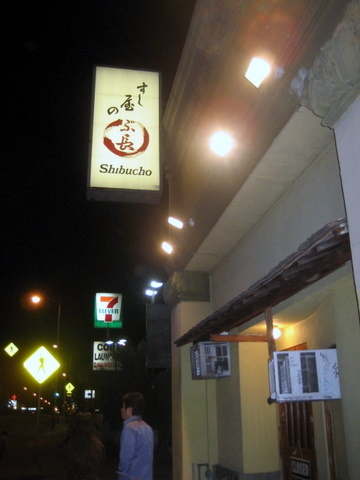 I had heard the name Shibucho before, but always in reference to the Costa Mesa restaurant which is supposed to be one of the best sushi restaurants in Orange County. Turns out the Los Angeles branch is run by a former employee, Shige Kudo. After being disappointed by the Orange County restaurant, I was a bit wary of the LA branch. I probably never would have come here on my own, but the idea of an "old red wine and sushi" dinner was interesting enough to entice me. 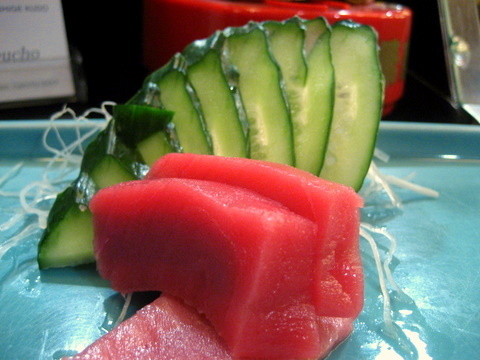 Those who know the restaurant will know of Chef Kudo penchant for pairing red wine with sushi. I must admit I was a bit skeptical especially given most of the pairings were old Bordeaux (only one bottle was younger than me). How would the delicate flavors of the fish stand up to such powerful wine? The list of wines follows. I used to think of this as the foie gras of the sea although lately I am noticing it is quite a bit leaner than good foie gras. The color of the liver changes and I noticed the red part is a bit more flavorful than the rest and stands on its own very well. By comparison the rest of the liver benefited from the addition of spicy daikon and scallions. Each type of shellfish in this melange had subtle textural differences but their mild sweetness was covered by the more intense sweetness of the sauce. I thought we were off to a good start with the reds, the Pavie-Decesse being tempered by the sweetness of the dish. 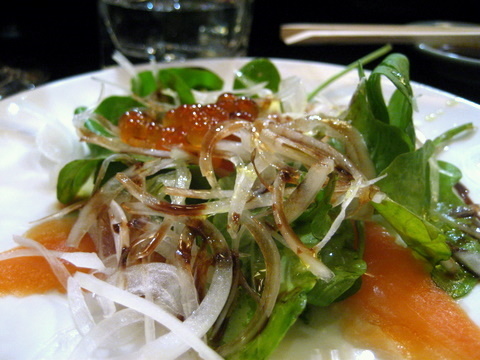 A beautifully done salad that seems more at home in a western-style restaurant than a sushi bar. The focus of the dish was definitely on the interplay between the vegetables. 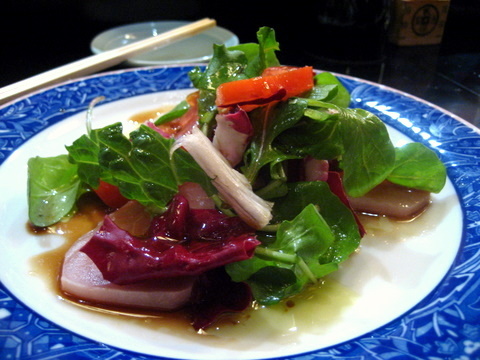 The ponzu sauce seemed especially sharp, and when combined with the flavors of the vegetables totally overwhelmed the fish, reducing the albacore to the part of textural contrast. A good Toro but not a great one. A very nice cut, tender and free of gristle or tendon but simply lacking that over the top fattiness and melt-in-your-mouth quality of the best Toro. One of the best pairings of the night was the toro with the rioja which helped to draw the flavor out of the fish. 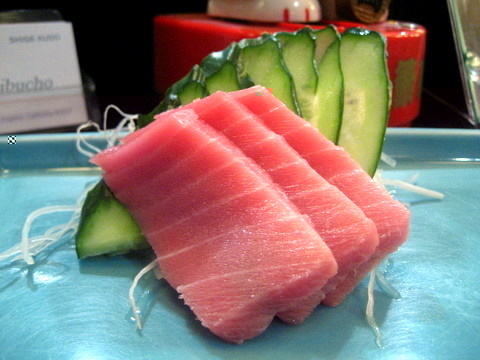 I don't understand the idea of serving Maguro AFTER the Toro. 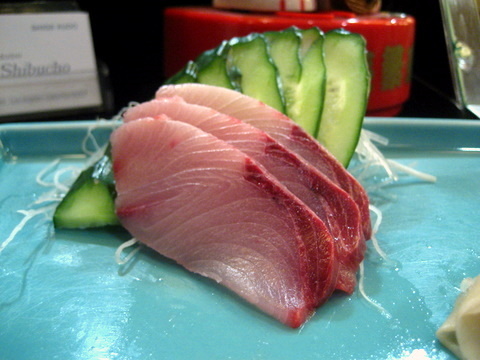 Maguro in general is a very common fish precisely because it is not too bold in taste or texture. Serving it after the Toro only serves to further highlight the blandness. To be fair this was a very good Maguro a but softer and fattier than most. Will mentioned it comes from the belly loin which might account for the extra fattiness. I have never been disappointed with Buri. 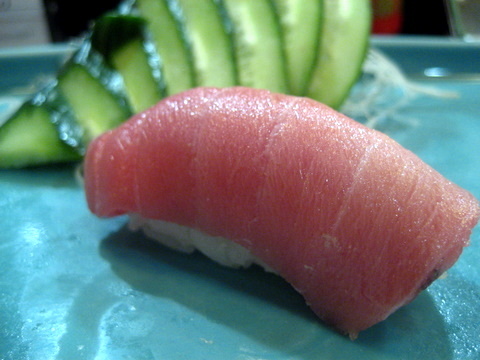 The wild yellowtail has a much leaner texture and a satisfying firmness its farm-raised cousins lack. 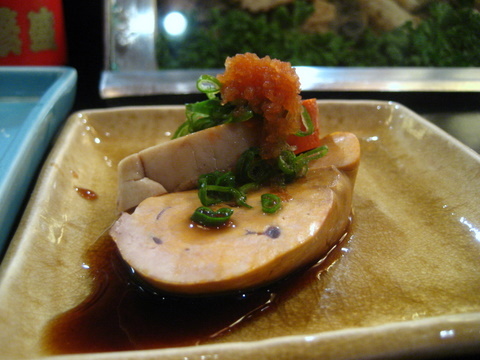 The flavor is more subtle and complex than Hamachi. The majority of the party seemed to enjoy the wine paired with the buri but I found their flavor profiles too distinct with no common ground to ease the jarring transition between the two. I used to enjoy Hirame but I have been finding it a bit bland of late. 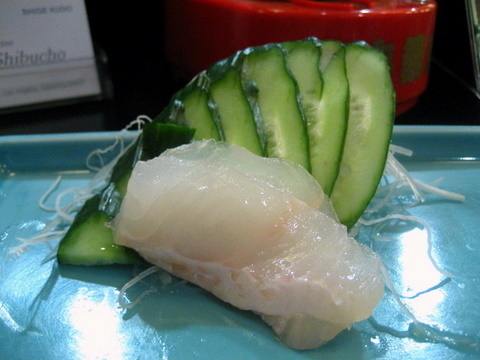 The fish is naturally light in flavor and really benefits from the yuzu and sea salt accents. A fish this light definitely needs to be enjoyed on its own. Indeed the wine utterly dominates the flavor of the fish. This wins for most out of place course. Although I think that is another distinctive feature of Kudo-san's cooking, the inclusion of western style courses in the omakase. The eggplant was very soft and smothered with melted cheese. 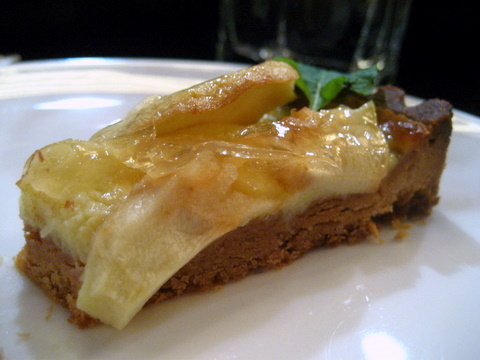 The overall flavor was very much like a cheese pizza, quite delicious. I suspect a couple of more European courses are thrown in because are more natural pairings with the wine. 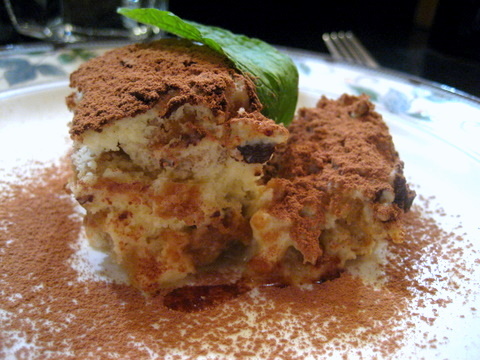 "Mother and Child" on one plate. Like the other salad, the vegetables and sauce dominated the fish. The Ikura was better able to hold its own against the bitter greens and sweet onion but the salad was definitely the focus of this plate. Another slice of the Toro we had earlier, it was still a bit lean but the rice added some subtle nutty notes and a nice temperature contrast. 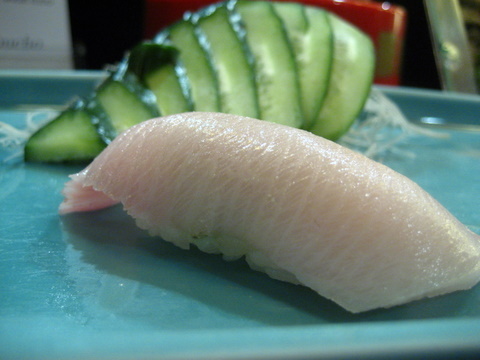 Yellowtail belly has been popping up more and more at sushi restaurants in the area. 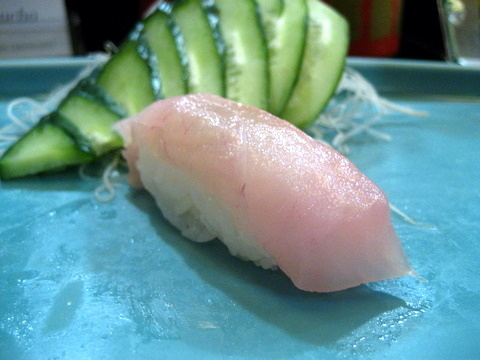 I find it much fattier and more tender than yellowtail but lacking the distinctive flavor of good Hamachi. 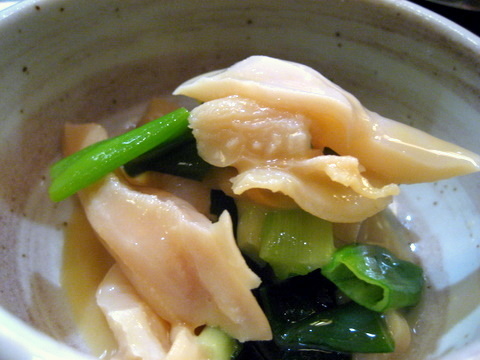 Tai is one of the fishes that can vary widely from restaurant to restaurant, some can be soft and mushy while others have an ethereal slick crispness. I don't think any other fish exhibits this much variability. Fortunately for me, this is one of the latter examples of Tai, beautiful texture and nicely flavored with yuzu and salt. I might have been out of wine by this point but I think this fish should be enjoyed on its own. 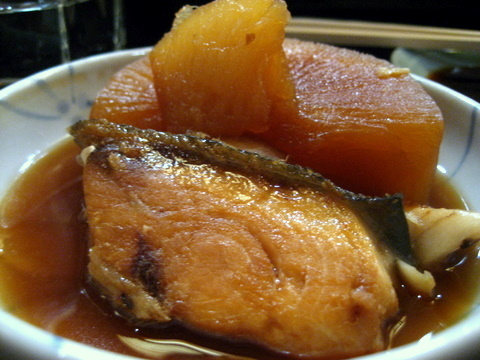 The golden eyed cousin of Tai is much softer and one of the few white fish that did not come seasoned with salt and yuzu, instead it is enjoyed with soy. Nice but still not as good as Tai. This was the course stewing on the little stove in the corner when we arrived. 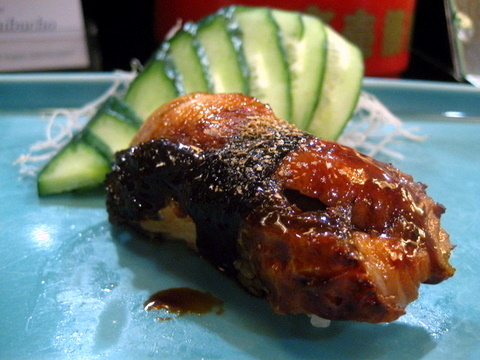 The buri collar was a bit tough from the lengthy cooking but the daikon was otherworldly. Almost rendered into a gelatin by the extended slow cooking, the daikon absorbed the sweet sauce and each bite released an even burst of flavor. This eel was so soft and fatty I couldn't believe it was sea eel and not the more popular freshwater eel. 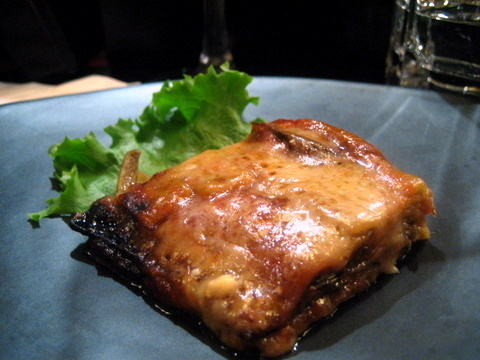 The seasoning on top of the eel added a tart contrast to the overt sweetness of the eel sauce. A number of diners weren't full with the formal conclusion of the omakase so they ordered Uni Hand Rolls. At $15.00 a pop, these babies come stuffed with uni. Unfortunately I have no picture as I did not order one but I was told it was quite good. 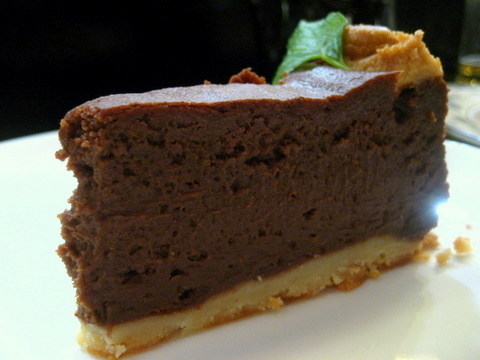 We received a trio of desserts to sample: Tiramisu, Chocolate Tart, and Apple Tart. The desserts were a nice close to the meal and a bit above desserts at your typical sushi restaurant, but they weren't particularly noteworthy. After a long night Chef Kudo was kind enough to pose for pictures with us. Apparently he has a reputation for being something of a sushi nazi but I didn't see it at all; he was smiling and chatting with us about wine the entire night. 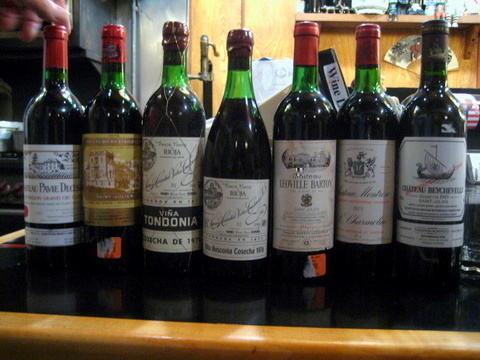 The list of what he has drank is incredible, including some 61 Bordeaux which he declared "too young." His own private cellar must be quite something as well, as he brought out a bottle of rare white Haut-Brion to show us after the meal. In addition to wine, Chef Kudo also stocks a selection of sake but he never touches the stuff himself. He says the sake in the US has added chemicals that change the flavor and make it unhealthy, but he has to have it since diners come in expecting it. 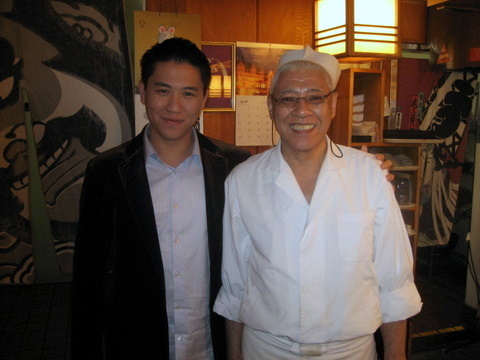 According to Kudo-san the best place to get sake is in the local area around the brewery. 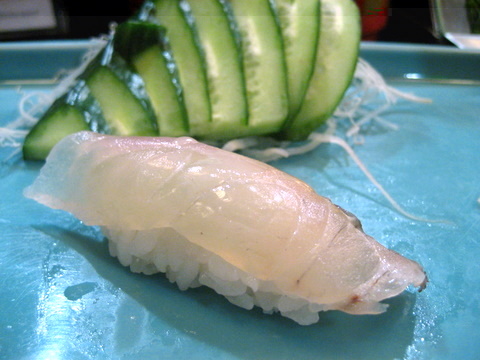 Judging on fish quality alone, Shibucho can hold its own against other top sushi restaurants. The pairing of red wine with sushi exceeded my expectations, but there were still some misses. This definitely works best with older wines, a young fruit bomb would totally overpower the fish. 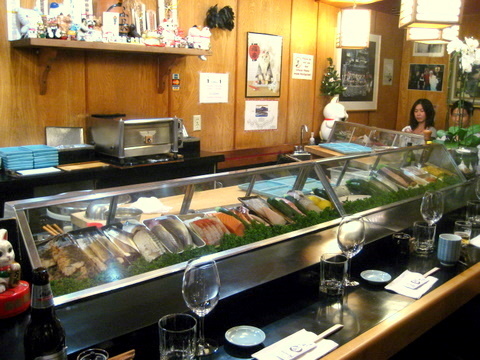 The pairing of sushi with red wine remains rare, but if you are so inclined to try it there is no better place than Shibucho. Some time long ago in the past a group of my friends went to a restaurant and were nowhere near satiated after the meal ended. Minh summed it up best when he said "I could eat a Double-Double right now." 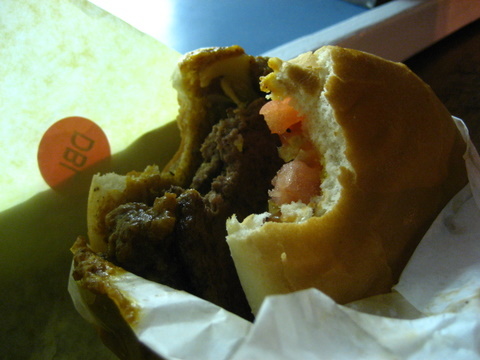 From then on, Double-Doubles became the yardstick by which we measured fullness. 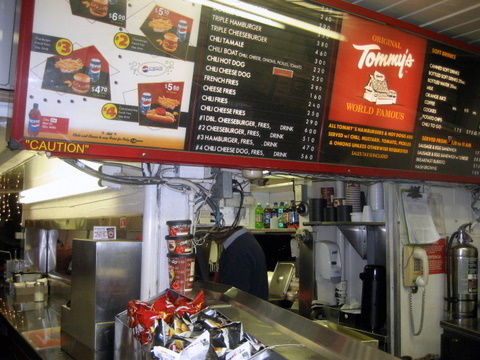 Interestingly we never tested this theory, but with the first Original Tommy's Hamburgers stand just a stones throw away how could we pass up this opportunity. 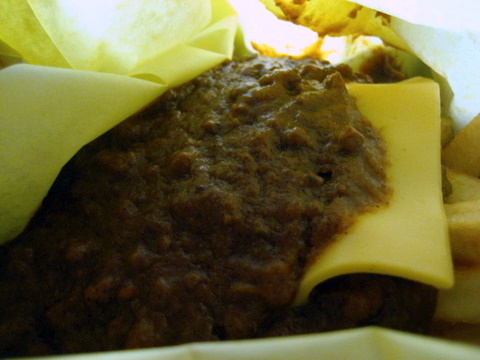 I ordered a Double Cheeseburger and polished it off with little effort. I foolishly challenged Kevin to take on the Mega Combo which consists of a Triple Chili Cheeseburger, Chili Cheese Fries, and a drink. This was perhaps a bad decision on my part as Kevin with his Kobayashi-esqe appetite, managed to devour the meal with some effort. Somehow the food comes out blazingly fast, I don't think I had finished paying before the food was cooked. That kind of speed worries me but given the volume, it has to be safe. 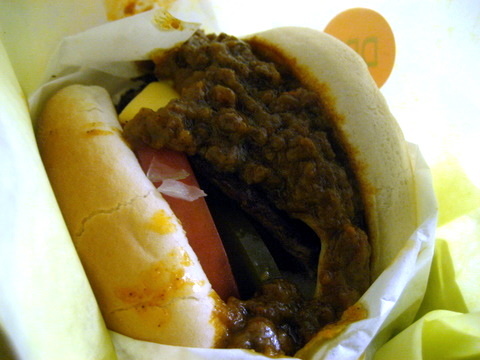 This was my first experience with a Tommy's Burger and I found it decently tasty and artery-cloggingly greasy especially smothered in the restaurant's famous chili. 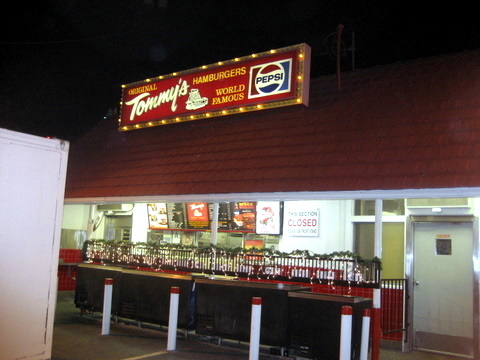 On its own, the burger is nothing special and from solely a food context there is no reason for this place to be hyped so much and to have people here at all hours of the night. Still there is some intrinsic value that comes from history and the atmosphere, well-heeled professionals standing elbow-to-elbow with someone in a grease stained jumpsuit. I don't think I'd ever come here just for the food, but I could see myself coming back once a year just to enjoy the culture. Hey Ryan. Nice work hitting up Tommy's after 17 courses at Shibucho. Thanks for coming out that night. There were some hits and some misses, but overall, it was great fun and great conversation. Looking forward to reading about NYC. Thanks again for hosting us. Next to Kevin's massive meal my mere double cheeseburger doesn't seem quite so impressive. I will shortly post my first experience in NY: Yakitori Totto.